The running line about Los Angeles is that it’s a city with no seasons. I think this is false for a variety of reasons, but for those of you who still feel adamant about this point, might I direct you to Drago Centro, which has been doing a bang-up job this year is heralding each quarter with a new batch of seasonal cocktails. I was lucky enough to partake in tastings of the Spring and Summer options, and recently, I was invited back to a media-comped meal at Drago where mixologist Jaymee Mandeville provided us with yet another new slate of drinks to celebrate fall. After the jump, take a look at pics of the cocktails and a few of the nibbles. 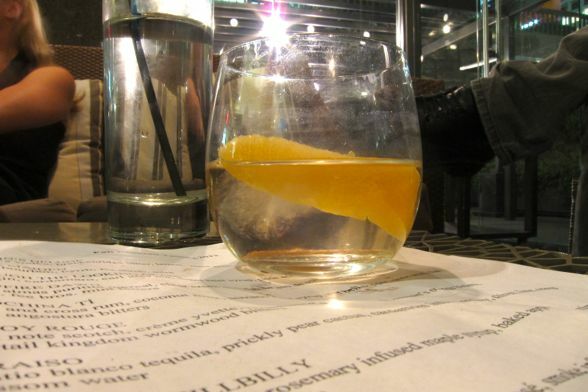 A few months ago, I raved about the totally awesome spring cocktails at Drago Centro, the esteemed Italian eatery in Downtown Los Angeles. Well, the seasons have changed, and so have the libations. Gone are mixologist Jaymee Mandeville’s fanciful uses of dill and honeycomb and kumquat. In their place are a new slate of drinks, many of which feature my most mortal enemy: BERRIES. Avid readers of this blog know that I have some strange, woeful distaste for berries that makes me generally gag upon first taste, not to mention whiff. 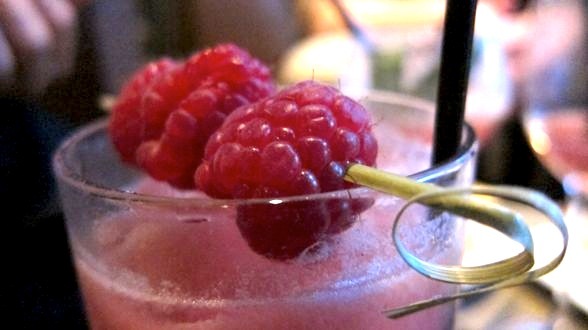 But given that being a food blogger is very serious business, I felt it was my God-given duty to bravely put aside my own apprehensions and dive headfirst into the fruity minefield that is the Drago Centro summer cocktail menu. Never has a media-comped meal been so fraught with anxiety. The revival of Downtown Los Angeles continues, particularly as it pertains to great bars and mixology. Making a mark of its own is Drago Centro, which unveiled its Spring cocktail menu a few weeks ago with a media-comped tasting session at its bar. When I received the invite for this event, my eyes nearly fell out of my head. Don’t worry though — all ocular function has been retained. Still, the cocktail menu that came with the email was a sight to behold. I wanted to try each and every one of the twelve or so libations on the menu — a first for me. Crafted by perhaps my new favorite bartender of all time Jaymee Mandeville, I can assure you these beverages rock. Let’s take a looksie, shall we? What in the What What?